“The whole F-35 enterprise’s IOT&E starts in September, so it’s not Navy F-35C that’s holding up IOC, it’s that we’re tied to IOT&E and need to see the demonstration and capabilities. We need to really see the 3F capability demonstrated in IOT&E and there’s just not going to be enough time to see enough of that before Feb. 2019,” Horan said. The upcoming IOT&E round of software testing is designed to show the military how well the 3F package works in mission situations and is an integral part of declaring the F-35C combat ready, wrote Rear Adm. Scott Conn in testimony provided on March 7 to the House Armed Services tactical air and land forces subcommittee. “After eleven years and over 16,000 flight hours, the full Block 3F SDD (system development and demonstration) developmental test phase is quickly approaching an end,” Conn wrote. 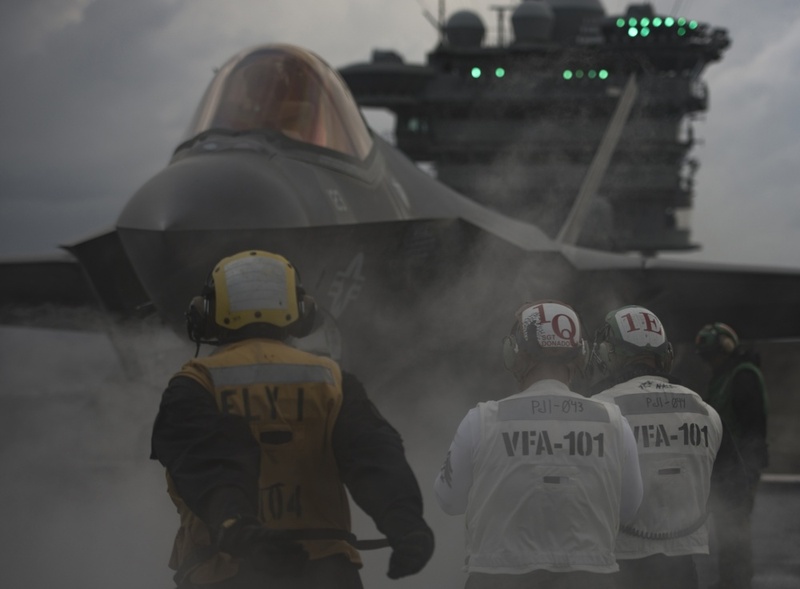 IOT&E will start after the long-predicted IOC, but Horan said there’s a possibility the Navy can see what it needs fairly quickly and still declare the F-35C combat ready inside the expected window. “I’m just saying that’s those dates are at risk and it’s based on the capabilities and events that we need to see,” Horan said. Interestingly, while not saying a delayed IOC is certain, both Navy and Lockheed Martin statements suggest this is case because of what is not said. A year ago, Lockheed Martin’s annual report provided investors with an F-35 update. “The program continues to advance towards the U.S. Navy declaring the F-35C carrier variant ready for combat in 2018, as demonstrated by completing final carrier tests aboard the USS George Washington in 2016,” the report states. Since then, Navy mention of F-35C IOC has seemingly disappeared. Last week, when pilots conducted F-35C day and night qualifications aboard Abraham Lincoln, there was no mention of a 2018 IOC. A Navy release described this significant milestone as being “in anticipation of F-35C operational testing later this year,” without mentioning an IOC date specifically. The Navy plans for its carrier air wings by 2025 to include F-35Cs, F/A-18E/F Super Hornets, EA-18G Growler electronic attack aircraft, E-2D Hawkeye battle management and control aircraft, and MH-60R/S helicopters. The first F-35C squadron deploying aboard USS Carl Vinson (CV-70) in 2021. Horan, speaking to USNI News, stressed this, saying as of now, a delayed IOC will not delay the 2021 deployment. “I don’t see any significant barriers to first deployment,” Horan said.